On Wednesday, June 27, 2018 Harley Wilson and Nat Lankford presented the Panola College Foundation with a check for $13,501.39 towards the Charlie Woods Memorial Scholarship. The Charlie Woods Memorial Scholarship was established six years ago by his friends and family to help sophomore students enrolling in Panola College’s petroleum technology program. Scholarship funds are raised through an annual raffle and the Charlie Woods Memorial Fishing Tournament held each year on Toledo Bend in May. Charlie Woods graduated from Carthage High School in 1972. He attended Panola College before entering a Ranch Management Program at Texas Christian University. Following graduation Charlie worked most of his life in the oilfield. Charlie was an avid fisherman. His love of the sport began at an early age when he fished with his “Papaw” Spurlock. Charlie fished the FLW Wal-Mart Bass Fishing League where he won first place in one of the tournaments on the Texas Tournament Trail. He also took first place in the Texas Oilman’s Tournament and the Louisiana Oilman’s Tournament. He and Harley Wilson also won a boat at the Toledo Bend Classic tournament. Charlie was also a member of the Carthage Bass Fishing League. He particularly loved the fishing trips with his friends to Lake Falcon in South Texas on the Texas – Mexico border. His plans were to eventually travel to Brazil to fish for Peacock Bass. Photo: (L to R) Harley Wilson and Nat Lankford with a check for the Charlie Woods Memorial Scholarship to the Panola College Foundation. (Longview, Texas)—LeTourneau University administrative offices will be closed Wednesday, Thursday, and Friday, July 4, 5, and 6, in observance of Independence Day. The Margaret Estes Library will also observe the holiday and will reopen to the public at 8 a.m. Monday, July 9. LeTourneau University is the premier Christian polytechnic university in the nation where educators engage students to nurture Christian virtue, develop competency and ingenuity in their professional fields, integrate faith and work, and serve the local and global community. LETU offers undergraduate and graduate degree programs across a range of disciplines and delivery models at LETU’s residential campus in Longview, Texas, hybrid options at centers in the Dallas and Houston areas and fully online programs. For additional information, visit www.letu.edu. CHS was proud to send five students to the National Speech and Debate Tournament in Fourt Lauderdale. Keaton Watlington made it to quarterfinals (top 24) in prose, a group that began with 444 competitors. 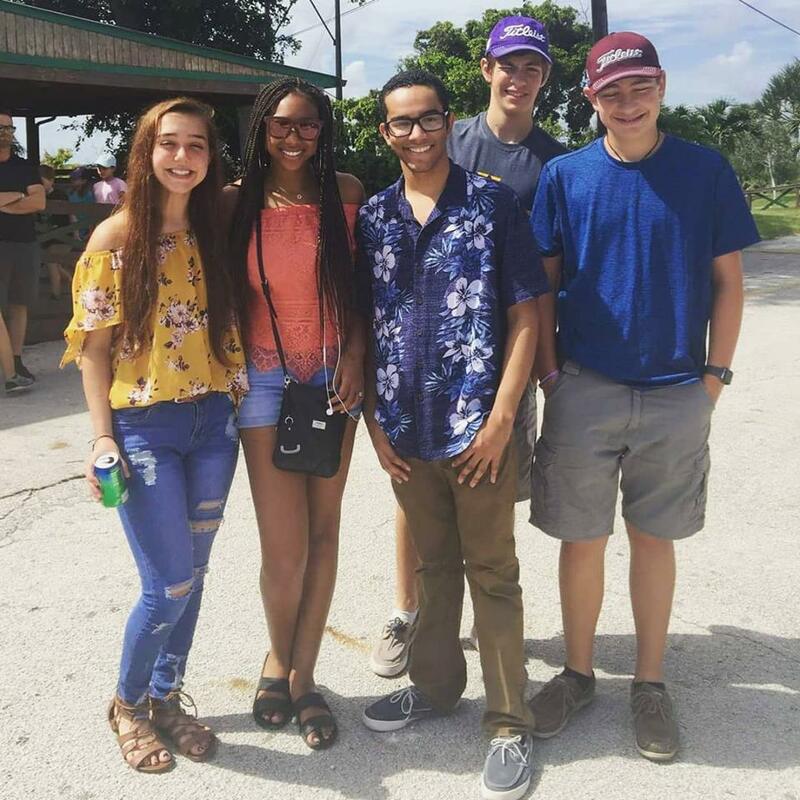 From left to right: Bryanna Sample, Esther Mergerson, Mark Perkins, Keaton Watlington and Jack Callen Watlington. Please join us in welcoming Celia Gonzalez to our CES family! 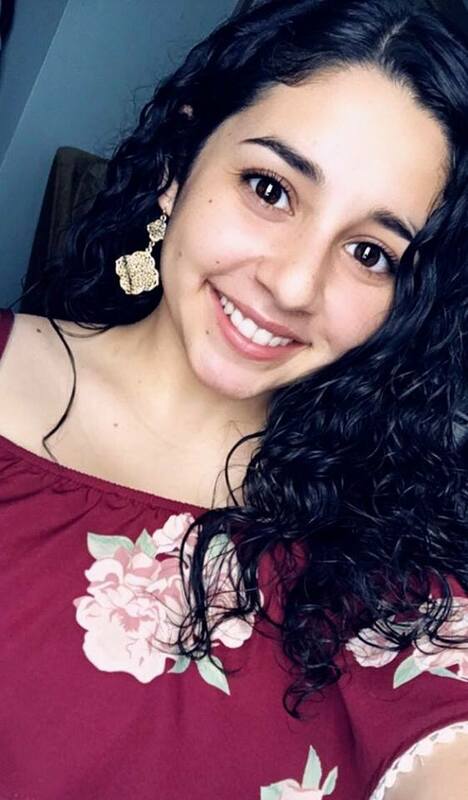 My name is Celia Gonzalez and I am so fortunate to able to start my education career at Center Elementary. I have always wanted to be a teacher and I am so excited to say that I will be teaching 1st grade this school year! I have lived in Center all my life and I'm so happy that I will continue to be a part of the Center Roughrider family. This will be my first year teaching, I graduated with my bachelor’s degree from Stephen F. Austin in December of 2017. I have worked as a substitute teacher for Center ISD in past five years. I have been blessed with 2 amazing parents and 2 younger brothers. I love being able to hang out with my family and friends. Helping children learn and grow has always been a passion of mine and I cannot wait to meet all of my students. A Special Called Board Meeting of the Board of Trustees of Center ISD will be held June 27, 2018, beginning at 12:00 PM in the Center Independent School District Administration Boardroom 107 PR 605 Center, TX 75935. (Longview, Texas)—LeTourneau University will launch a new, 100% fully online Bachelor of Science in cybersecurity degree beginning in the Fall 2018 semester to help meet the estimated record demand of 1.5 million jobs in cybersecurity expected to open by 2019. More than $1 billion in losses were incurred in 2016 alone resulting from cybercrime, according to the FBI, making cybersecurity one of the world’s most rapidly growing fields. Students in the program will learn to protect critical information and defend against threats like industrial espionage, organized crime and terrorism. The program is for students seeking a high-impact, high-reward career that is more than just a job but is a calling. Median salaries in 2017 were around $95,000. Industry professionals with decades of experience, from a former Fortune 500 analyst to a Fulbright Scholar, provide one-on-one personalized instruction and mentoring. Dedicated academic advisors guide cybersecurity students through their path to graduation. The degree is attainable within four years, but that can be accelerated for students choosing to take courses during the summer semesters. Courses vary in lengths, with some 15-week courses and some 5-week courses that are offered year-round in Fall, Spring and Summer semesters. Gowing added that students in the Longview and East Texas area could choose to take some classes in the classroom, making their fully online program a hybrid program including both online and on ground instruction. LeTourneau University is the Christian polytechnic university where educators engage students to nurture Christian virtue, develop competency and ingenuity in their professional fields, integrate faith and work, and serve the local and global community. LETU offers undergraduate and graduate degree programs across a range of disciplines and delivery models at LETU’s residential campus in Longview, Texas, hybrid options at centers in the Dallas and Houston areas and fully online programs. For additional information, visit www.letu.edu. The SHS Dragon Band’s recordings from this year's UIL Concert and Sightreading Contest, in which the band earned 1st division ratings for all judges, have advanced to the STATE level of both the ATSSB Outstanding Performance Series (OPS) and the TMEA Honor Band competitions. The area round of the ATSSB OPS was held on June 19 at Orange Grove High School in Orange Grove, Tx. The Dragon Band’s march (Emblem of Unity) received 1st place, and the band’s concert piece (Brave Spirit) received 3rd place. Both pieces will advance to state. The area round of TMEA Honor Band auditions was held on June 22 at Spring High School in Spring, Tx. The Dragon band’s concert contest performance (Emblem of Unity, In the Shining of the Stars, and Brave Spirit) were among the three area bands that will advance to state. The state level of competitions for each contest will be held during the Texas Bandmasters Association Convention in San Antonio, Texas on July 26 – 28, 2018. Congratulations to the Dragon Band, and good luck at STATE. July 4th, until school starts in the fall. July 4th – Plan to join the Tenaha Businessmen’s Club for an evening of fireworks, concession, and the Calvary Boys on the Tenaha ISD Raymond Jackson Stadium (The Pitt). Parents can register their child for the upcoming 2018-2019 school year now! Click link to our Tenaha ISD web page for a complete set of instructions. Existing students click the following link: http://tenahaisd.com/Page/1014 and for new students click the following link: http://tenahaisd.com/Page/1013. Inductees may be nominated five years after graduation or have given five years of service to Tenaha ISD. Class of 2018: 1-2 Honorees nominated by at least 3 TISD Alumni as chosen by the Hall of Honor Committee and approved by the Tenaha Independent School District’s Board of Trustees. The 14th annual induction ceremony will take place on Saturday, September 29, 2018 at the TISD Cafetorium. All inductees will be introduced to the community during a pre-game ceremony prior to the game between the Tenaha Tigers and the Timpson Bears at a time yet to be determined. Nominations to the Hall of Honor must be made by former Tenaha High School Alumni. The Tenaha ISD Child Development Center located on the Tenaha ISD campus is now opening enrollment for the 2018-2019 school year. The costs for infants up to 18 months is $125 per week and 18 months and older will cost $115 per week. There is a onetime $50 registration fee and a $50 supply fee due in August and again in January. There are a limited number of spaces available. Contact Amy Collins at 936-248-5000 ext. 508 if you would like to enroll your child. Tenaha Youth Center's Summer Meals for Kids Program begins July 2, and serve every Monday, Wednesday and Friday except July 4th, until school starts in the fall. The Tenaha Baseball team has baseball hats for $15. All of the proceeds will be used to buy the team new “jerseys” for the second half of district. All sizes are stretch fit! If you have any further questions let me know. size small to xl are $15, larger sizes up to 4xl are $18. If anyone want to order one please contact Felicia Brock (brockfelicia@tenahaisd.com or FB) your size and how many you would like to buy. 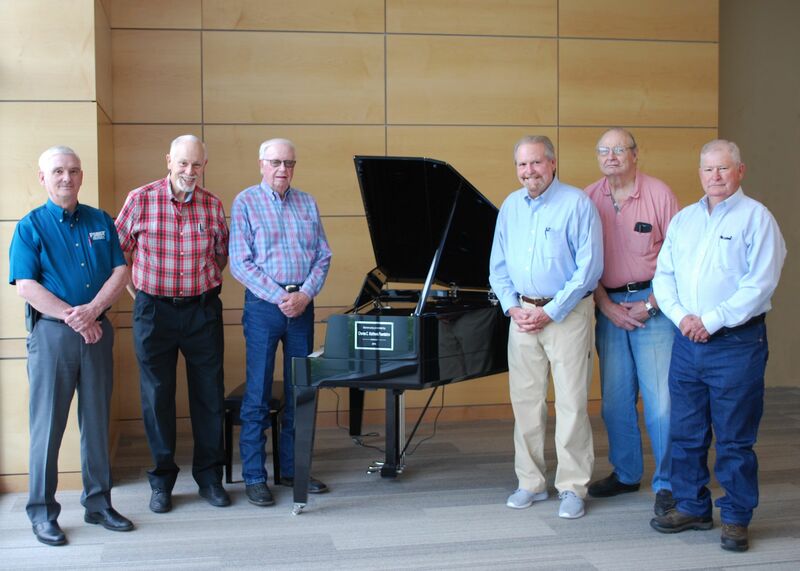 On Tuesday, June 19, the Charles C. Matthews Foundation met at Panola College to view the new Yamaha AvantGrand piano the Foundation had recently donated to the College. The Yamaha AvantGrand piano will reside in the Frances B. Ross Ballroom located in the Charles C. Matthews Foundation Student Center. This state-of-the-art electric piano utilizes innovative technology to produce a grand piano performance at any volume. The addition of the piano will allow for the Panola College music department to host additional concerts in the ballroom, and since the piano does not require tuning, the piano can be moved throughout the Student Center to be used at a variety of functions. The elegant piano was just one of three generous donations the College received from the Charles C. Matthews Foundation this summer. The School of Energy received funding to purchase the program’s first piece of robotic technology, a KUKA Robotics KORE welding machine. This robot is a hands-on education robot that will be utilized in programmable logic and welding courses. Students will learn how to use the equipment as a robotic tack or track welder with the addition of a Miller wire welding machine to complete the weld. The robot is also capable of being programmed to sketch with the use of a dry erase marker. The Charles C. Matthews Foundation also established the Charles C. Matthews Foundation Endowed Scholarship to help support a growing financial need students face in noncredit workforce and continuing education programs that offer certification. One of the main obstacles the 1,301 workforce and continuing education students faced this past year when enrolling in their courses was the lack of financial aid resources. Even though these programs offer an almost instant return for students to earn a wage, it is often difficult for students to obtain the upfront cost of their education. Students in a workforce program are not eligible for federal financial aid and have minimum opportunities for obtaining a loan to complete their education. With the new endowed scholarship made available by the Charles C. Matthews Foundation, Panola College workforce and continuing education students have the opportunity to be awarded up to 50% of the total cost of their program. This scholarship will help students gain marketable skills and certifications that they otherwise may not have the financial resources to complete. Programs that will benefit from this new scholarship will include certified nurse aide, dental assistant, EKG technician, medication aide, pharmacy technician, phlebotomy, truck driving, welding, and real estate. A Special Called Meeting of the Board of Trustees of Center ISD will be held June 18, 2018, beginning at 12:00 PM in the Center Independent School District Administration Boardroom 107 PR 605 Center, TX 75935. Tenaha ISD Regular School Board Meeting for June 18, 2018 5:30 pm, June 18, 2018 Hearing to Discuss the Budget and Tax Rates 5:15 pm, and June 18, 2018 Public Meeting to Discuss Federal Programs 5:00 pm. Joaquin ISD will have a school board meeting on June 18th at 6 p.m. at their Admin building. July 2, 2018-Tenaha Youth Center will serve a meal every Monday, Wednesday, and Friday except July 4th, until school starts in the fall. THE FIRST SESSION WILL BE HELD JUNE 25-28 AT THE CHS TENNIS COURTS. CHS SUMMER SINGLES TOURNAMENT (PART OF THE EAST TEXAS SUMMER CIRCUIT) WILL BE HELD JUNE 29TH AT THE CHS TENNIS COURTS. Honor Band is the highest award a concert band can receive in the state of Texas. The purpose of honor band is twofold. Many educators believe that through the process of hearing and observing the results of quality teaching, directors can develop their own instructional skills to a higher level. In addition, selection of an honor band in each classification recognizes communities and school systems that successfully support music in education through their instrumental music programs. Bands enter at the region level by submitting a recording of a three-selection concert program recorded at a public performance. Those bands who advance from region move on the area judging and those who advance from area are then judged at the state level. On June 13, 2018 TMEA Region 21 held its Honor Band judging session in Lindale, Tx. The Shelbyville HS Dragon Band recordings are advancing to the AREA round of the contest. This is the second competition this summer that the Dragon Band has advanced to area. Congratulations to the Dragon Band, and good luck at the next level of competition. Carthage, TX - How do you get males interested in a health science career such as nursing or occupational therapy assisting? You do what Panola College did and present a one-day, interactive, engaging event for male students from area school districts. After receiving funds from a grant to increase non-traditional participation in career and technical programs, like those in health sciences, leadership from within the College of Nursing and Health Sciences at Panola College planned and presented the first annual Man Enough for Health Sciences event on May 3, 2018. This event was attended by approximately 50 males in grades 8-12 from Carthage, Garrison, Gary, Jefferson, Marshall, and Waskom. One of the key purposes of the event was to reduce the stigma often associated with males who work in health science careers. Males make excellent health care providers. Like their female counterparts, males who work in these careers want to help others and often say that they are drawn to fields like nursing because of the excitement they get saving lives. 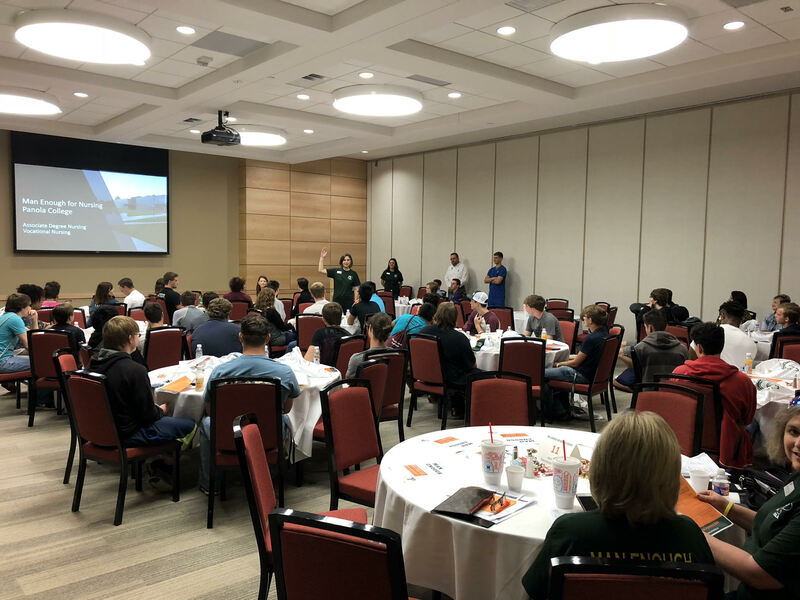 Students who attended the event learned about careers in nursing, occupational therapy, medical lab technologies, and medical assisting from males who work in each of those fields. 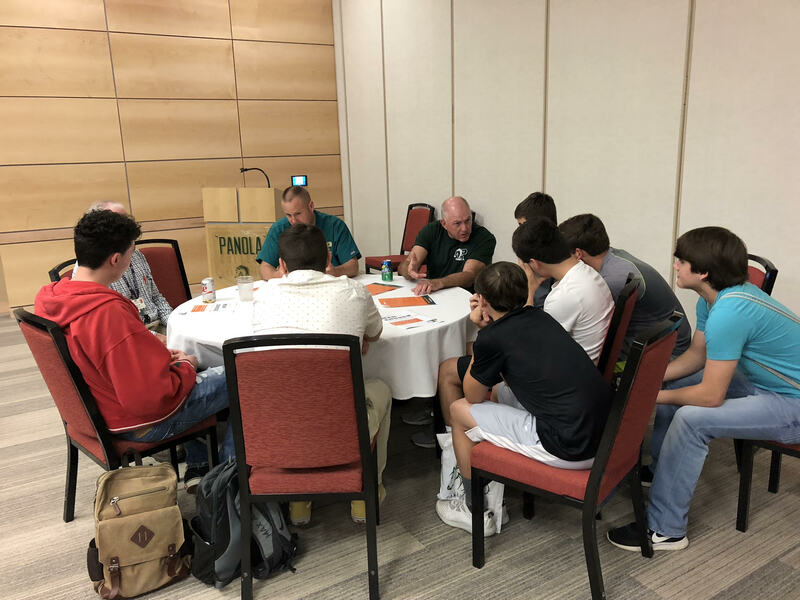 During roundtable discussions, students were able to talk to the guest speakers and other men who currently work in one of the careers presented. Several of the guest speakers and roundtable presenters were current Panola College professors, alumni, and current students. During the hamburger luncheon, students learned from Kelly Reed-Hirsch, Dean of Health Sciences, about Panola College, dual credit courses, and what they can do to prepare for admission into the health science programs like Nursing or Occupational Therapy Assisting. 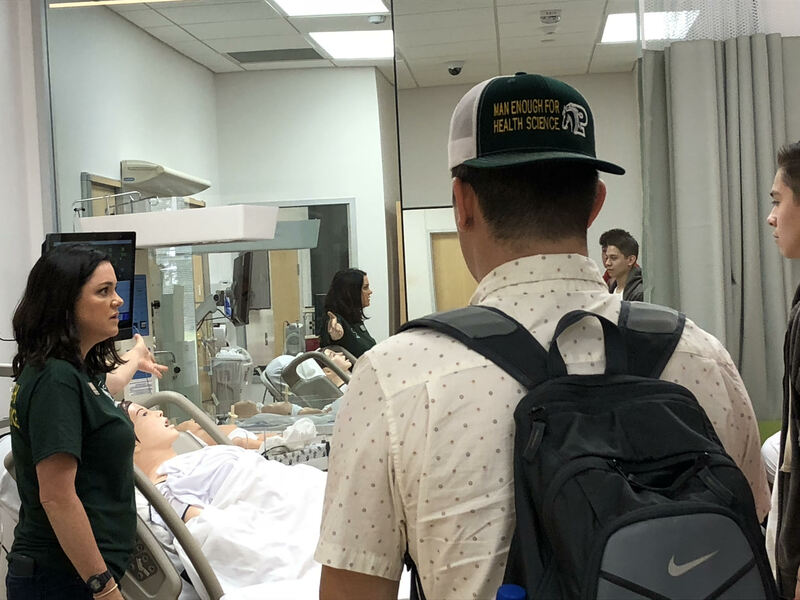 Before the end of the day, students had toured the award-winning Health and Natural Sciences building, viewed simulations, and were able to participate in a variety of hands-on activities. Students used words like “unexplainably amazing” and “awesome” to describe the event, and 85% stated that they thought more positively about careers in health sciences than they did before the event. Careers in health sciences are well-respected fields with a wide variety of employment opportunities. But considering the 9:1 ratio of females-to-males in the field of nursing alone, there is a need to provide male students a chance to explore these careers early. Careers in health sciences are reliable, well-paying, and provide the satisfaction of being able to provide for your family that some careers may not without many years of education and experience. Panola College offers seven programs in the School of Nursing and Health Sciences that provide students with marketable skills that local employers want in their employees. For programs like the Vocational Nursing and Medical Assisting, a student can complete the one-year program and earn a certificate that prepares them to receive licensure to practice in those fields. Programs like Associate Degree Nursing, which leads to becoming a Registered Nurse, and Occupational Therapy Assisting require two years to complete before earning a college degree. 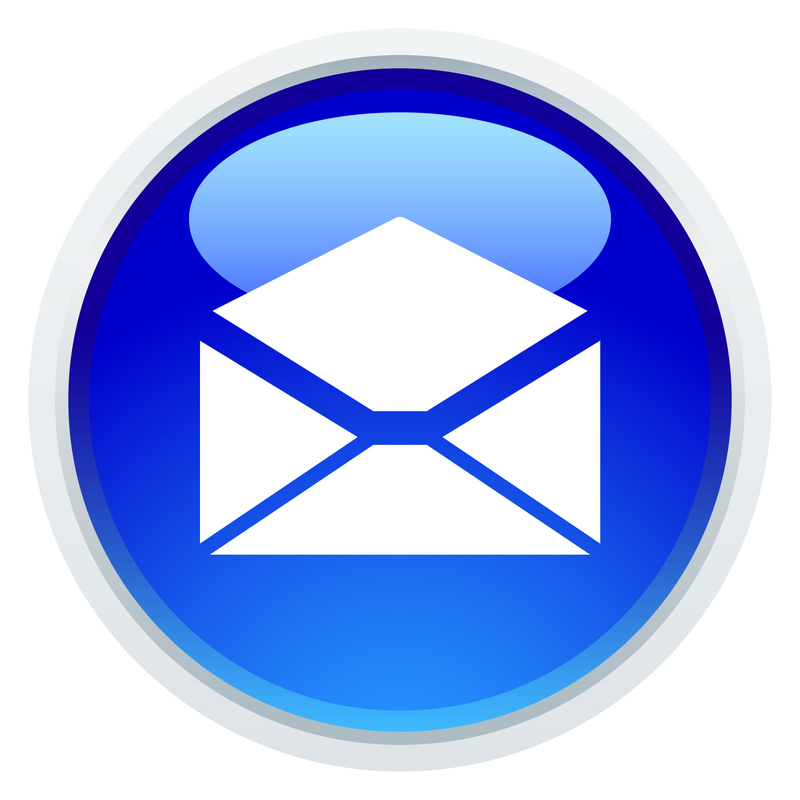 Districts that did not get to participate will have another chance during the upcoming school year. Businesses interested in becoming a sponsor for the next Man Enough for Health Sciences event, please contact Dean Reed-Hirsch at Panola College. Chair of ADN and VN Nursing programs, Annissa Jackson, RN, discusses the nursing programs at Panola College with the Man Enough for Health Sciences participants. Participants learn from Panola College faculty and current ADN students during roundtable discussion time. Success Coordinator, Jennifer Gaston, RN, shows participants the high-fidelity manikins used to simulate labor and delivery. Center ISD School board meeting on June 13th at 12 p.m.
Tenaha ISD is hiring for a maintenance position. Click Here for the Maintenance Position Job application. Notice is hereby given that on the 12th day of June 2018, the Board of Trustees of the Joaquin School District will host a training session at 5:30 p.m., at the Joaquin Annex at the corner of Horn and Southern street in Joaquin, Texas, for area School Boards. Notice is hereby given that on the 11th day of June 2018, the Board of Trustees of the Joaquin School District will hold a special meeting at 6:00 p.m., at the Administration building, Joaquin, Texas. June 9, 2018-Basketball Camp in Tiger Gym- Ages:5-10 Time 9 am-12 pm; Ages:11-15 Time 2 pm-5 pm. If you have any trouble registering student(s) please call Tenaha ISD 936-248-5000 ext. 401. If you do not have a computer and or internet access please come to Tenaha high school and use the school’s computer to complete the registration process. The Tenaha ISD school board will have a meeting on June 4th, 2018 at 5:30 p.m. in the boardroom at the adminsitration office located at 138 college street in Tenaha.